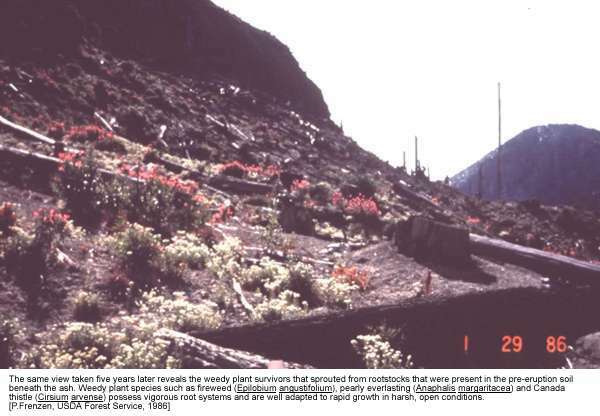 Even after a major volcanic eruption, it doesn't take long for life to return to the scene, as shown here at Mt. St. Helens. Soon after the picture on the left was taken, "pioneer" plants, such as fireweed and Canada thistle, started to populate the area. Eventually, a recognizable forest will fill the view. Click on the pictures for enlarged views. From a geological standpoint, Mt. 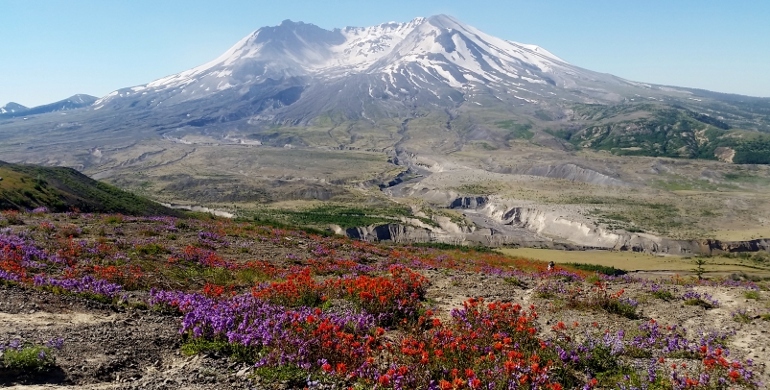 St. Helens is a good representative of all of the volcanoes in the Pacific Northwest. The reason the volcanoes exist in that area is due to the subduction (diving underneath) of one crustal plate under another. As the rock forming the plate sinks lower into the underlying magma it heats up. This heated rock rises up and eventually bursts through the overlying plate (in this case the North American plate). Mt. 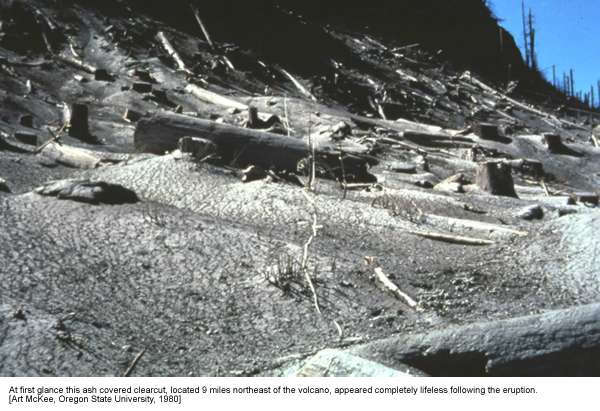 St. Helens is simply the most recent location where the heating caused a burst. 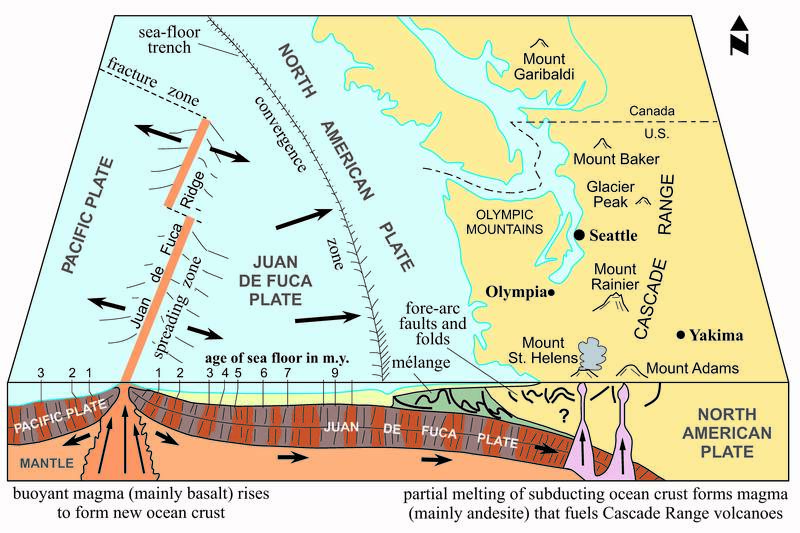 The Juan de Fuca plate is subducting, or diving, under the North American plate from northern California to British Columbia. Just inland from the plate boundary is a line of volcanoes, including Mt. St. Helens. Below is a playlist of videos about Mt. St. Helens. Findley, R. "Mt. St. Helens: Nature on Fast Forward." National Geographic. Vol. 197, No. 5, p. 106. May, 2000.